Two year ago on this blog, I compared the quality of service and particularly delivery speed of Amazon and Thalia.de, the online store of Germany’s biggest bookstore chain. Back then, Amazon won that comparison hands down and indeed I only order English language print books from Thalia.de, when I have a discount coupon and the books is a fairly common title from a big publisher. Nonetheless, I still visit Thalia‘s brick and mortar bookstores, whenever I find myself in the vicinity of one. And if a book catches my eye in the English language section, I usually buy it. Because I like bookstores and I like the browsing experience. Besides, I want brick and mortar bookstores to survive. And so the Thalia chain got quite a bit of my money over the years. However, after my experience at the Thalia bookstore on Obernstraße in Bremen today, I won’t be shopping there again. Instead, I’ll order online and not at Thalia.de. Now the Thalia bookstore on Obernstraße is a massive three-storey flagship store with approx. 2300 m² of retail space. When it opened approx. fifteen years ago, I was overjoyed. The Obernstraße Thalia store was and continues to be Bremen’s biggest bookstore. It had comfy chairs where you could sit down and read. It had the biggest English language book department in town. It had a manager (long since departed for greener pastures) who was supportive of the local literary scene and even agreed to carry the literary magazine I was involved with. 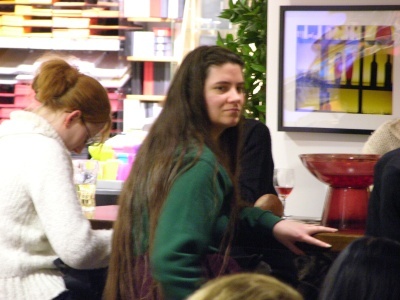 We even did a reading there in February 2005, i.e. exactly ten years ago. Here is a photo of me at that reading BTW. However, over the past two years or so, the quality of the Obernstraße store steadily declined. The product range started to include more and more magazines, greeting cards, stationery, DVDs, toys and other non-book stuff. The number of comfy chairs was drastically reduced in order to make room for a massive Tolino e-reader display. Not that I have a problem with Thalia promoting the Tolino reader it co-sponsors, but did they have to do so at the expense of the comfy seats. The foreign language section was stuffed into the furthest corner of the ground floor, where you can barely turn around without bumping into display tables full of audio books, while the old domicile of the foreign language section in the basement has been sublet to a travel agency, because I absolutely want to book a journey every time I’m in a bookstore. The quality of service also got worse. Books started showing up shelved in sections where they clearly didn’t belong such as a one of J.R. Ward’s Black Dagger Brotherhood novels on the YA shelves and highly awaited books that were supposed to be embargoed until the official release date landed on the shelves early, leading to spoilers and all sorts of ugliness. Waiting times at the cash register got longer, especially if someone ahead of you wanted a book gift-wrapped. And heaven help you if you needed to ask a question. Meanwhile, the second Thalia store in the city centre, in a location that had been a bookstore under various names since the late 1980s, closed early last year and has been replaced by a chain clothing store, because we obviously don’t have enough places in town where we can buy clothing by that particular brand. Today I chanced to be in the city centre, so I went to the Thalia store to check out the foreign language offerings. I even found something, namely Foxglove Summer, book 5 in the Peter Grant series by Ben Aaronovitch, which I kind of like, The Girl With All the Gifts by M.R. Carey, which has gotten a lot of great buzz online, and This House is Haunted by John Boyne, because it sounded like the sort of traditional gothic novel that is very hard to find these days. So I walked to the cash register with my three books in hand, books that would have cost me about 25 Euros altogether. However, the main cash register on the ground floor was packed with a lengthy queue of people, very few of whom were actually buying books, snaking among the display tables. “Okay”, I thought, “I’ll simply go to the cash register in the basement. However, the cash register in the basement was also packed. And the basement cash register is slower in general, because this is also where people who have special-ordered book go to pick them up. Which shouldn’t take ages, but usually does. And a surprising number of people still special order books in the days of the internet. “All right”, I thought, just a little peeved by now, “Let’s try the cash register on the first floor then.” So I took the escalator up to the first floor and lo and behold, there was no queue at the cash register. So I walk up to the cash register, only to find myself faced with a sign: “The cash register is currently closed. Please use the cash register on the ground floor.” Judging by the amount of dust surrounding it, the sign had obviously been there awhile, which means that cash register has been “currently closed” for a while now. Which leaves only two cash registers for a three-storey store hat was quite full, because today was a school holiday. And it wasn’t as if the store was understaffed, since there were several staffers standing around at the computer stations where you can have them special-order books. At one point, there were even three sales people crowded around the same computer station, studiously ignoring the customers. For me, this was the straw that broke the camel’s back. I took the escalator back to the ground floor and saw that the queue at the main cash register had gotten even longer in the meantime. And I decided that I didn’t want to queue up for ten minutes or more for something I can order online without queuing up at all. So I dumped the books onto the nearest display table – not one dedicated to either SFF or foreign language books, just a display of the collected oevre of the inexplicably popular Jojo Moyes – and left. Now I love books and I love bookstores and yet I walked out of a bookstore without buying something. This isn’t the first time I had problem with excessive waiting times at the cash register of Thalia either. During my last visit to the Obernstraße store back in December, the queues were endless as well. Back then I put it down to the pre-Christmas shopping rush. However, this excuse doesn’t really hold in February which isn’t exactly a busy book buying month. No, the customer service at this Thalia store is simply bad. Now bad customer service isn’t exactly rare in Germany, since it is considered extremely gauche here to complain about long waiting times, badly organised stores and just bad service in general. And if customers never ever complain about bad or slow service, no one ever does anything about it. It wasn’t even the first bad customer service experience of the day, because just earlier a snooty leathergoods shop in town suddenly no longer had any handbags with shoulder straps in store, because the sales people apparently didn’t like mine and my Mom’s clothes and didn’t think we were going to buy one of their overpriced handbags. And judging a customer’s solvency by their clothes or make-up is always a really bad idea. Be snooty about it and I’ll never darken the doorstep of your bloody store again. Besides, Thalia is a subsidiary of the perfumery chain Douglas, which is infamous for its bad customer service and rude sales people. I don’t think I’ve ever met anybody who actually liked shopping at Douglas. The only reason people go there is because Douglas killed off all the independent perfumeries. So I’m pretty much through with Thalia. If I want a book, I’ll order it from Amazon right away, brick and mortar stores be screwed. Besides, all three books I looked at were cheaper at Amazon, because the German fixed book price agreement does not apply to foreign language books. Though I won’t actually order any of the books I wanted to buy today, because on closer reflection I haven’t really enjoyed the recent Peter Grant novels all that much (and then there is this) and I’m not at all convinced that the M.R. Carey book will be down my alley. As for John Boyne, his forray into gothic fiction was only ever going to be an impulse buy anyway. This entry was posted in Bookselling and tagged Amazon, bad customer service, Bremen, brick and mortar stores, gothic romance, newleaf, Thalia, tolino, urban fantasy. Bookmark the permalink. 3 Responses to Amazon versus Thalia revisited or Why brick and mortar bookstores are losing customers? The description of the “product range [starting] to include more and more magazines, greeting cards, stationery, DVDs, toys and other non-book stuff” reminded me of how things have been with the Barnes & Noble brick-and-mortar stores I’ve been in lately, as well as the Borders store before it closed. This tells me they’re trying to “adapt” but in the wrong way. Rather than expanding their product line to include things that people can find elsewhere (at potentially much lower prices), they should be adapting the overall shopping experience, making it so enjoyable that people are willing to take their time to physically go to the store, spend time there, and not balk at moderately-higher prices. Looks like they’re learning exactly the wrong lessons from the mistakes made elsewhere. For which there is really no excuse, because you’d expect that they’d follow what happened to the big US bookstore chains. On the other hand, what do you expect from a chain whose management makes most of their money from overpriced cosmetics. Too bad about this story. It took me longer to read this article than it did the writer to make it to the register for purchase. So I guess there will be a lot of people who will sit on their fat asses and buy from Amazon. I had a terrible experience with Amazon as I purchased an album that was no longer in print, but available by download. The download didn’t work, and I wrote Amazon three times without even a reply. So I didn’t buy anymore downloadable music with Amazon. Hurray for vinyl. Its back and its electronic signal is an audible sine wave [aka–analog] unlike the copycat digital signal that is always chasing the sine wave to replicate it as faithfully as possible. I got a used vinyl album from a local record store of the undownloadable [and out of print]Amazon version of the record. Living sweet is the best revenge!